Syed Rasel was born 3 July 1984 in Jessore. He is a Bangladeshi cricketer. He is a left-handed medium-fast swing bowler who came up through the ranks of the under-19s, to the Bangladesh a team, to the full Bangladesh team, while playing for Khulna Division. Playing for Bangladesh A against Kent in August 2005, a 21 year old Rasel took 7 for 50 in the first innings and finished the match with ten wickets. He was rewarded with a spot in the Bangladeshi squad for the tour of Sri Lanka the following month. He went on to make both his Test and ODI debuts on the island. Figures of 4 for 129 came in the second Test at Colombo. A sensational spell of swing bowling for Bangladesh A against Kent in August 2005 propelled Syed Rasel into the international reckoning at the age of 21. Having steadily developed his trade on a difficult five-week tour, Rasel tore through Kent's defenses with figures of 7 for 50 in the first innings and 10 for 91 in the match. Find Syed Rasel profile and stats of batting, bowling and fielding including latest updated news of Syed Rasel, videos and images at Hamariweb.com. 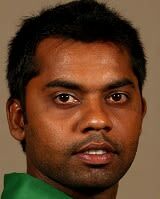 Also find detail Player profile and career statistics of Syed Rasel of Bangladesh. Syed Rasel - Find Syed Rasel of Bangladesh Cricket Team complete player profile, number of matches, runs score, wickets & catches, Statistics, Records, Syed Rasel Latest News, Syed Rasel Videos, Syed Rasel Photos, and other Syed Rasel Cricket Team players.